This year’s Quantum Innovation Lab (QIL) workshop brought together representatives from leading technology companies with researchers from universities across the UK, to discuss how advancements in quantum technology can make their way to market in the real world. Quantum technologies such as quantum computing and quantum key distribution, make use of the unique properties of quantum mechanics to achieve results beyond the reach of today’s technology. 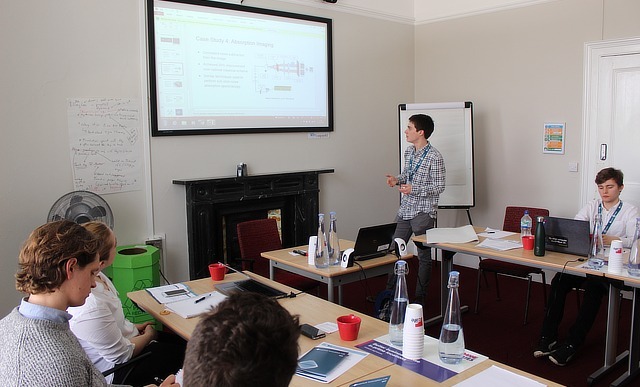 QIL is organised by the Quantum Engineering Centre for Doctoral Training (QECDT) at the University of Bristol which is training the next generation of researchers in quantum technology. Bristol is a leading city in the development of these technologies, with programs like the QECDT complemented by the Quantum Technology Enterprise Centre, a program training PhD graduates to grow their research into startup companies, and the Quantum Technology Innovation Centre, an incubator solely focused on quantum companies. Education networking provider Jisc was looking at the transition of quantum technology to market, for example by providing the fibre required for quantum networking. Microsoft looked at how its Quantum Development Kit for programming quantum computers could be used to teach quantum concepts and to help the spread of quantum technology among technicians outside of physics and computer science. QIL has been running since 2017, with previous attendees including Airbus, Hitachi, MSquared Lasers, Leonardo, Deutsche Bank and BT. As a result of the discussions, numerous projects have taken place, notably including collaborations involving PhD students from the QECDT.